Lekool Games has decided to attempt to reel in more gamers with a new giftpack giveaway promotion for their free-to-play MMORPG. For the newly opened server for Angels Wrath. The name of the promotion for server number 4 is called Crouching Tiger, Hidden Dragon. 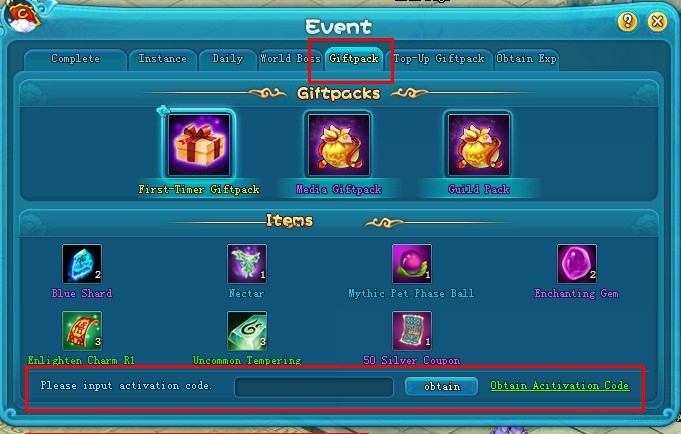 The giftpack giveaway is a global promotion, available to any and everyone who plays the game. So how do you get a hold of it? Well, it's a simple four step process and the only restriction is that you have to play on server 4... assuming one could consider that a restriction. So basically, you get a backpack's worth of goodies in the promotional giftpack, that includes a super experience scroll, for those who want to level quickly... very quickly. A rank 4 medikit, for those who have a lot of life and need quick restoration. A rank 4 for energy pack, for those of you out there power-leveling your characters without 'roids... this rank 4 energy pack will do the job just nicely. An enlighten charm pack, for the gamers who lack charisma. An enchanting stone for powering up your equipment, and last and probably not least... a Zephyr. Your guess is as good as mine. Anyway, Angels Wrath would be considered as one of those cutesy anime-MMORPGs, where the conflict is light, the enemies are tame and the challenges are shallow. If you don't mind a more social atmosphere over a competitive one, then Angels Wrath might fit your tastes like OJ Simpson fits prison. You can get in on the action right now or you can follow the steps below to find out how to retrieve a key and get hold of your very own promotional gift package... for free. That's right, it's free; no strings attached. Make an account and login to Angels Wrath at http://angelswrath.lekool.com/. Grab one of the promotional keys directly off our Gaming Blend Facebook Page. That's it, you're done. Easy peasy. Nothing to it.